On October 12, we hauled our luggage through the Underground to the airport and left on a flight for Dusseldorf. The first thing we had to do was figure out how to catch a train to our destination, Essen. I spent several minutes fiddling with the ticket vending machine and managed to get a group ticket, but I wasn't quite sure how to read the route map to find a train to our destination. From what I could tell, the next express train wasn't leaving for another hour. Fortunately for us, a kind stranger asked if he could be of assistance. It turns out he was going the same place, and he knew how to find a train (not an express) that would depart sooner. He was also traveling on a group ticket that was valid for up to five people, so he let us travel with him and share his ticket in exchange for me giving him the one that I had just bought. The German train system is extensive and relatively convenient, if you know how to buy the proper ticket and read the train schedule. What seemed bizarre to me (in comparison to the train system in Japan) is that there were never any turnstiles at any of the stations for checking the tickets. Instead, the system relies on random spot checks by conductors, with fines for passengers traveling without tickets. Also, there are substantial discounts for traveling in groups; only one person in the group has to be carrying a ticket. We got off the train at the main station in Essen and located the tourist information office where we bought our tickets for the gaming trade show (Internationale Spieltage, aka Spiel) we were there to attend. Then we took the subway to our hotel, which was around the corner from the convention center. We splurged on this particular hotel, and I think it was worth it for not having to travel the subway every morning to commute to the convention. Tens of thousands of people attend, and though many drive cars, the subway is still packed to the gills every day. The hotel also had good wi-fi service, which would turn out to be uncommon (at least at the more budget hotels where we stayed later). The morning of October 13, we set out early to find breakfast. We selected a little cafe a couple blocks away. Germany is full of little sandwich and pastry cafes; while that made it easy to find something quick to eat, eventually one gets tired of eating sandwiches. 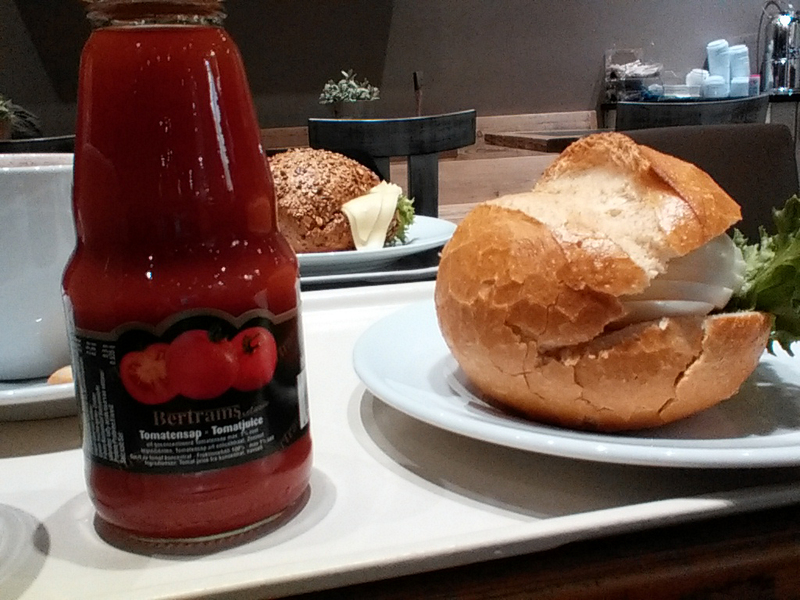 We were partial to this one, however, because it served a brand of tomato juice with a familiar name. After breakfast, we walked to the convention center, and along the way we first noticed the bike path. 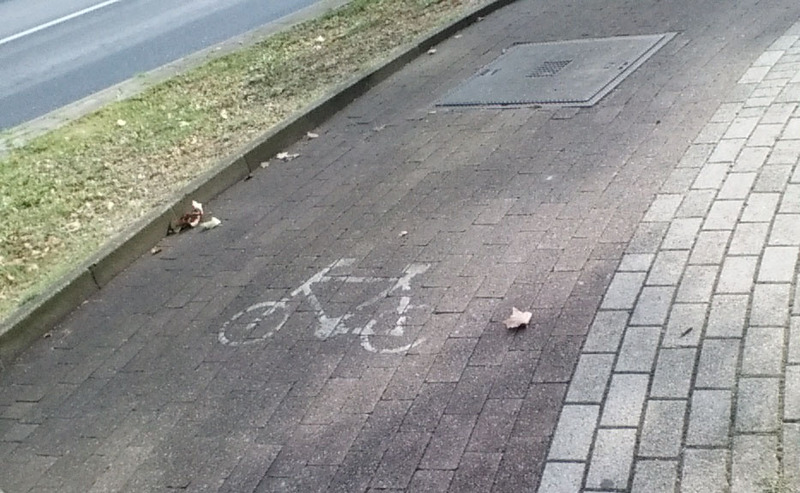 Bikes are everywhere in Germany, and while the bike paths are sometimes marked on the streets, often they are part of the sidewalk. The distinguishing feature is that they are paved with a different type of brick from the area intended for pedestrians. 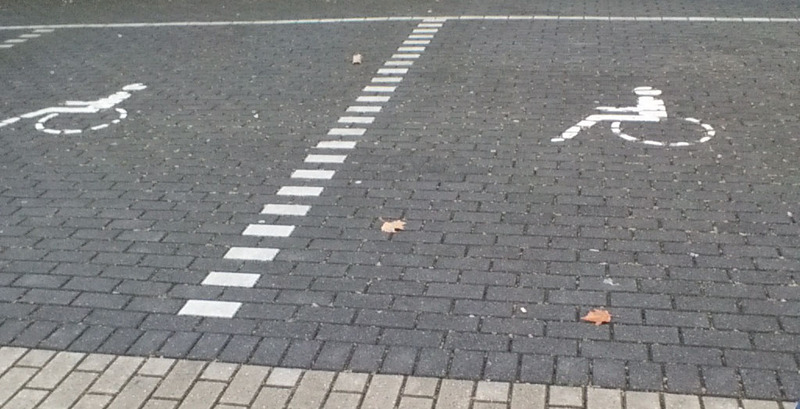 (This technique is used for other purposes as well, such as demarcating handicapped parking.) While this is certainly clever, since it eliminates the need for repeatedly touching up painted lines, it means that pedestrians have to be constantly watching the stones at their feet to make sure they aren't wandering into a bicycle zone. While I'm on the topic of paving techniques, I should mention that Germany seems to have a love affair with cobblestones. 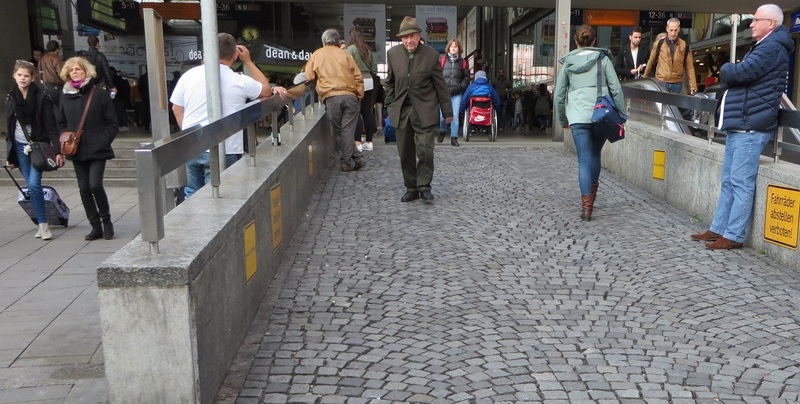 Not only do they use bumpy cobblestones for regular sidewalks, they also use them for areas where they KNOW people are going to be rolling wheeled objects, such as the area in front of a hotel, or the handicap-accessible ramp leading to a major train station. Honestly, I can't imagine what they were thinking. Anyway, we spent the morning browsing the vendors at the convention. While not as gargantuan as Comiket, it's still huge, and the whole thing is packed with people trying and buying board games. I had made up a list in advance of the games I wanted to see and purchase, so I dashed through the halls with my parents in tow to get to the vendors I was afraid might sell out. Once the initial rush was over, we wandered in a more leisurely fashion. We ran into Richard Ham, a popular game reviewer, who remembered us from Gen Con two years ago. We also stopped by the table where his wife was selling her handmade glass crafts, and I bought a set of decorative coasters. At noon, we attended the math trade, where I exchanged a bunch of games that I didn't need anymore for a bunch of new-to-me games. My parents were a great help in this endeavor, as they could stay in one place with my stack of games to be given away while I could venture into the mass of traders to locate the people with games for me to collect. Once the trading was accomplished for the day, we went out to a pizza place for lunch, then plunged back into the crowds for more exploration of the vendor halls. We stayed until the evening, when my mother and I attended an informal meetup of a bunch of women who chat on the BoardGame Geek forum. It was fascinating to meet everyone in person; they were not only from Germany, but also Poland and other surrounding countries. Everyone spoke English because it was the one language they could all understand. Once the gathering broke up, we picked up my dad and all went out for supper. I had looked up a list of vegetarian-friendly restaurants in the area, so we went to one of the places on the list, which was actually a burger joint. It wasn't something I would have tried on my own if I hadn't seen it on the list, because I would have thought there wouldn't be anything we could eat. As it turns out, despite the prevalence of sausage everywhere, vegetarianism (and veganism) is apparently popular in Germany. Many restaurants have special vegetarian sections of the menu. We never had any trouble finding something to eat. Even when we went to a steak house where the name of the restaurant was literally Meat (well, technically it was "Me[e/a]t"), they would substitute a vegetarian burger for any of the regular burgers on the menu. Friday, October 14, was mostly a repeat of the previous day. We got breakfast at the cafe, then attended Essen until the midday math trade, where I concluded all my game exchanges. In the afternoon, we walked into town, where I wanted to stop by a bookstore to buy an authentic German cookbook. We had a late lunch of sushi before returning to the convention for a last-minute game purchase. At that point, I measured the weight of my suitcase with all the games in it, and I found that I was at my limit. I could still fit a little more in my handcarry luggage, but as I intended to buy souvenirs later in the trip, I knew that I had to stop buying games or it wouldn't all fit. Due to that, we decided not to go back to the convention, even though our tickets were good for two more days. Instead, we spent Saturday morning at the shopping mall near the main train station. It was interesting to see all the shops there, and we had a nice Indian curry lunch. We also encountered our first public restrooms, which are pay-to-use. The one at the mall had an attendant standing in front of a table with a little tray of coins. When a person finishes using the restroom, the requirement is to toss a 50 Euro-cent coin into the tray. Because of the necessity of paying coins to use restrooms, I had to make sure to keep an abundance of small coins at all times. The system at the mall at least made sense. Later, we would encounter the system used at the train stations, which is rather bizarre. The restrooms are blocked by automated gates. There is a machine on the wall that accepts coins to open the gate. 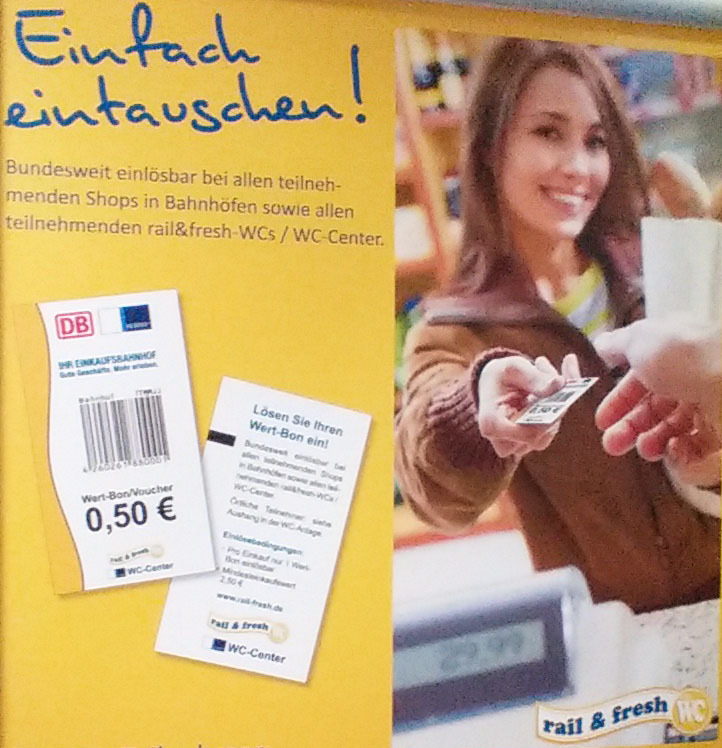 Your choices are either to pay 1 Euro coin, in which case you get back a coupon good for 50 cents at any of the station shops, or to pay a 50 cent coin plus a 50 cent restroom coupon (from a previous visit), in which case you get nothing back. So you're actually being charged double if you use the coupon. One might think this system is intended to save the cost of hiring an attendent, as at the mall, but in fact there was an attendent present (I presume to help people who didn't know how to operate the machine and to make sure there were no gate-jumpers). I didn't really understand the point of the strange coupon system, but I guess it works for them. We walked back to our hotel and packed for the rest of our trip. Oh dear, the cobblestone ramp. I can only laugh. We have brick streets on our college campus, and though it looks pretty, it's not very practical. It's extra slippery in the winter, and a huge pain to do any street repairs. I think it's a bit odd brick streets are so common in Europe. No picture of your game haul?? I didn't get a photo until I returned home and unpacked my suitcase. I'll add it at the end. I guess I didn't spend enough time in Germany to experience (or at least remember) the toll toilet system. I feel like I've encountered toll toilets somewhere, but strangely, I can't remember where.